This fast-paced deck utilizes creatures as a well-oiled resource pool to synergize with combos intended to whittle your opponents life totals down to nothing, while also keeping you topped up. The deck is able to perform quite consistently in One Vs. One, as well as multiplayer. However, it should be taken into consideration that I play with a fairly casual playgroup and cannot speak for more competitive tables. The main strategy of the deck involves getting one or more Blood Artist s and/or Zulaport Cutthroat s into play. These cards are the meat and potatoes of the deck, without them your strategy will not be as productive. You generally want to prioritize getting these cards out as early as possible and stack them. Do not worry about losing life in the early game, as you will swiftly be able to recover if you build your field presence. Now that we've got at least one Blood Artist or Zulaport Cutthroat on the battlefield, we can begin to set the trap. With a playset of Bile Urchin s, Death Cultist s, and Qarsi Sadist s we are going to be causing many life-loss triggers against our opponents. However, we have to understand WHEN and HOW to use these cards to gain the biggest advantage. 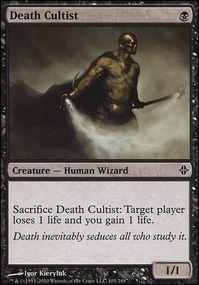 Starting with Qarsi Sadist , let's talk about the strategy with this card. For , Qarsi Sadist has an ability called Exploit; this ability allows you to sacrifice a creature when it enters the battlefield. A common mistake when using Exploit is that people will often use it on ANOTHER creature. However, we want it to target itself; that's right... we want the Qarsi Sadist to exploit ITSELF. The reason for this will make sense later, but to put it briefly, we want this creature card in our graveyard. Once it has exploited itself, it will cause your opponent to lose two life, and you to gain two life; in addition to any of your triggers from Blood Artist and/or Zulaport Cutthroat . Death Cultist and Bile Urchin are very similar cards, with the urchin being slightly worse. Both cards have a slim casting cost of , meaning we can get them out fairly early and consistently early-mid game. Both creatures have a unique sacrifice ability that does not require them to to activate, meaning that once the spell resolves you can activate it right away (since you still hold priority, they do not require haste to activate). These abilities are both targeted life-loss, once again synergizing with both Blood Artist and Zulaport Cutthroat to maximize the total life lost and gained. However, you must be clever when playing these, it is not often best to activate them right away; timing is everything. For example, these creatures can be used to block an opponents attacking creature, then sacrificed at instant speed (maintaining the block, but still benefiting from the ability and its triggers). Additionally, if it is possible, try to get as many Blood Artist s and/or Zulaport Cutthroat s onto the battlefield to maximize your efficiency. We should have a basic understanding of the bare-bones of the deck by this point, but we have to discuss the victory condition. We should have been able to whittle our opponents life total to a modest number, now we want to destroy them... We are going to utilize Killing Wave to hopefully end the game. While we have most likely sacrificed all of our own creatures, our opponents are pitifully holding onto theirs; we simply cannot allow that. For and , Killing Wave forces each opponent to sacrifice EACH of their creatures unless they pay life. "But wouldn't they just sacrifice all of their creatures to save their own life?" Yes, Foolish Mortal... they will sacrifice their friends in a pitiful attempt to survive... and that's when our trap will snap shut around them, securing our victory! While they may avoid the Life-loss trigger, our Blood Artist s will ensure that they pay for their actions; forcing them to lose life for each creature that dies. Hopefully, you will have had a chance to utilize the special land, Forbidden Orchard , to create some useless creatures on their battlefield; bolstering the amount of life lost. Additionally, we can take advantage of Forbidden Orchard by using Minister of Pain to kill all of our generous donations. One of the most important things to keep in mind while playing is that you never want to run out of gas. Mid-late game you are going to need to reliably fill your hand, Grim Haruspex is going to provide card draw for each of our non-token creature deaths. Additionally, we are going to be wanting to use our Death Cultist s and Bile Urchin s to pester our opponents. Each time we sacrifice them with Athreos, God of Passage on the battlefield, our opponents will have to make the tough decision of whether or not they will pay the three life to put them into our graveyard. If they do not, they run the risk of us simply re-casting them and exploiting their error of judgement. Teysa, Orzhov Scion is the final piece of the puzzle. While the strategy of the deck is generally consistent with creature decks, we still have to worry about larger creature threats or a creature that an opponent refuses to let go of. Here is where we will employ Teysa's Exile ability, to remove that pesky creature from the game. Cauldron Haze can be used to cause a similar effect before you sacrifice all of your creatures to Killing Wave or their abilities. I hope this guide has been helpful and informative; I've had a lot of fun building and playing this deck. Feel free to leave some advice, ask questions, or simply comment on the deck! After doing some more play-testing, I have decided that the deck requires more realistic graveyard recursion. Pyrrhic Revival can be fun, but it can also provide far too great of a benefit to our opponents.